Sophie Digard fait le buzz sur internet. Un large choix ici NOUVEAUX ARRIVAGES DE LA COLLECTION SOPHIE DIGARD CREATIONS!!! On ne compte plus les qualificatifs sur son pouvoir d'attraction:"I just bought one on Saturday at Fortnum and Mason’s. I tried not to but I had to have it"
Au Japon, aux Etats-Unis, en Scandinavie et en Australie, les fans rivalisent de qualificatifs enthousisates. Celle-ci, par exemple, on l'adore, elle nous vient d'une cliente américaine, Susan : " her color sense and crochet work are simply out of this world"
French designer Sophie Digard creates the most exquisite scarves and accessories. Each handcrafted artwork combines a rich colour palette and crocheted designs incorporating tiny ‘fleurs’ and patterns using only the finest of wool and linen. Her whimsical creations are unique treasures unlike no other. We especially love it when Sophie gets playful with mixing textiles and adding dimensional elements! How fantastic is this Biscuit Pop Scarf? The scarves are in fine merino wook and linen and seem perfect for every mood and occasion. But can you stop at one! Oh yes! I love mine very much! :) Wish I had enough money to get another scarf...they are just scrumptious (traduction : succulentes)! a bunch of stockinette squares sewn together, then having a crocheted edging. crocheted scarves with stunning colours. designed by Sophie Digard of Paris, France, they are meticulously hand crocheted in linen or merino wool. and making them one of a kind works of art. a piece you can and will wear year round, any occasion and love it forever! She uses a natural vegetable dyeing process that can take weeks per item. French designer Sophie Digard creates the most exquisitely detailed, hand-crocheted, heirloom-quality pieces – scarves, necklaces, brooches, bags, baby clothes and blankets – that have long been treasured by clients and collectors around the world. Her work is so very beautiful. Seriously, she crochets like nobody I’ve ever seen before and uses the most labour-intensive techniques to create her intricate pieces from fine wool, mohair, velvet, and linen. 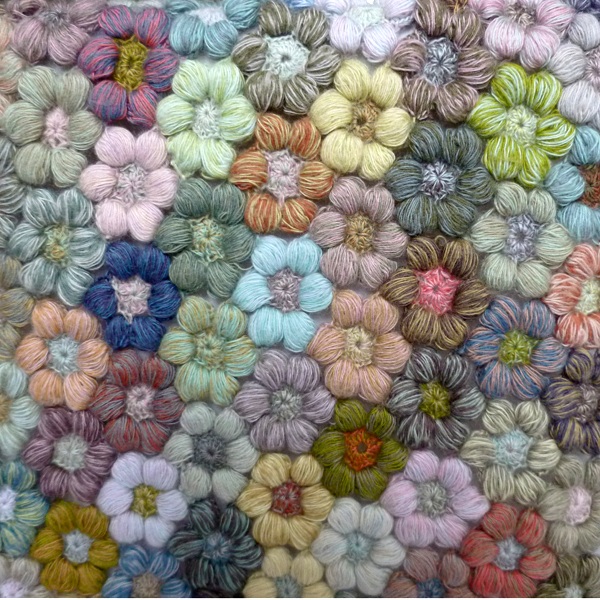 ...i'm sure all of you have already heard of, and seen, Sophie Digard's stunning and inspirational crochet work. I absolutely adore her rich colour palette, which she creates by working with multiple strands of fine yarn to blend her own unique colourways... they have a very timeless quality. Parisian Sophie Digard is renowned for her gorgeous designs and color combinations. This airy new style features crocheted circles knit and laced together for a classic vintage look. The Crochet Scarf is lighter in weight than others we carry, but the wool is just as soft and cozy. Beautiful whether you wear it long or twined around your neck, this ethereal design is gorgeous all year round. exquisitely detailed, hand-crocheted, and heirloom-quality work of art that has been created using subtle colours that together create a visually stunning piece. French designer Sophie Digard creates exquisitly detailed, hand-crocheted, heirloom-quality fashion accessoires that have long been treasured by clients and collectors around the world. Crafted from fine wool, mohair, velvet, and linen for Summer, Sophie Digard pieces can be worn year-round and are destined to become wardrobe favorites and indeed, treasured pieces to be passed from one generation to the next. French designer SOPHIE DIGARD creates artworks that beg to be touched - curious geometric and floral shapes each crocheted individually. 1)Fine multi-coloured threads of pure wool are crocheted around lavishly rich circles of different coloured velvet to encapsulate them into joined squares to create a scarf of exquisite craftsmanship. In Sage green, lilac, grey and deep blue, Sophie Digard scarves are a real wonder to look at and extremely difficult to get hold of! 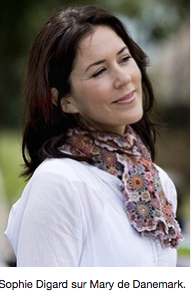 We are one of the only stockists of Sophie Digard scarves online, so why not treat yourself! 2)Colours of the herb garden, lavender, sage and rosemary. Sophie Digard scarves are a real wonder to look at and extremely difficult to get hold of! 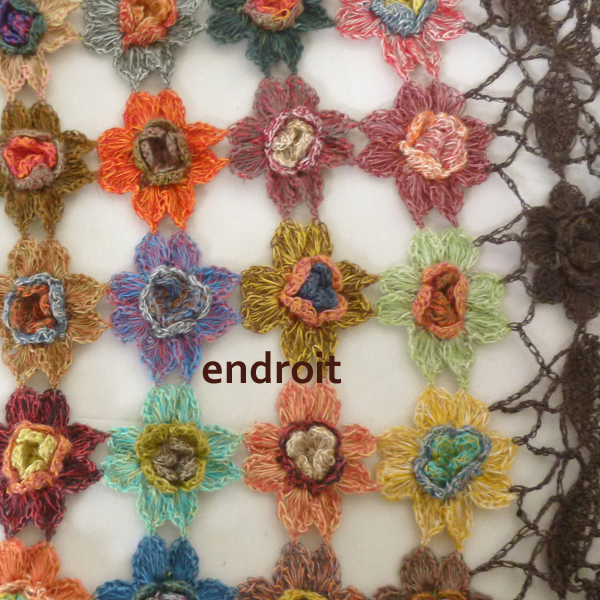 A gossamer web (=un tissage arachnéen) of linen, indian summer colors with neutral edging. Hand crocheted for Sophie Digard in Madagascar. Amazing ! No matter how many times I receive orders from Sophie Digard, when a new one arrives my heart beats faster. And then they arrive… they are so beautiful that tears come to my eyes. I remind myself : they are not all for me…but then I have fun photographing them and now and again adding to my little personal collection! Anyway, some new ones came today and I hope you have as much fun admiring them as I do! Sophie DIgard is a parisian knit wear designer, and above all, a colorist. Fibers made and dyed to her specifications in France are shipped to her workshop in Madagascar where they are hand crocheted, knitted and embroidered into unique works of art. Parisian Sophie Digard is renowned for her gorgeous designs and color combinations. She knits and crochets intricate mosaics that are fluid and playful. The intricate work in this GORGEOUS crocheted linen scarf is mind-blowing. The colors are stellar, too. But, wow, so chic and sophisticated and eye-popping! l'envie folle qui nous saisit, mine de rien, sur le blog collectif des "granny maniaques", de copier (oh ! les vilaines, les petites intrépides gonflées d'outrecuidance) les incroyables créations signées Sophie Digard, celles qui crèvent l'écran de Bright Star. French designer Sophie Digard creates hand-crocheted fashion accessoires. It's simple, but stunning. I fell in love with these colors. Nous : des couleurs le plus souvent assourdies par les mélanges, quelquefois vives mais jamais, oh grand jamais criardes ! Barbara Worn I read that she blends more than 60 colors to get the effect she wants. She is brilliant! In my dreams, I will own one of these one day! Beautiful! What a fabulous collection, I love Sophie's work. Sophie Digard creates curious crocheted flowers with soft buds, each leaf and petal knitted individually. Her roses are beautifully crafted jewellery, scarves in intricately patterned stripes and swirls, reminiscent of a painting by Klimt. Her extensive colour palette - each hue is made up of sixty threads in merino, mohair, and velvet - gives rich, intense individual tones and makes each item unrepeatable. Sophie Digard bien sûr ! How beautiful is this Sophie Digard scarf!!! And I'm sure, in person, it's more beautiful than the picture because all of Sophie Digard's hand-crocheted things are. Truly works of wearable art! I especially love the small, colorful bobbles. I am in love with everything Sophie Digard makes. Her crocheting needles are magic! I own a Sophie Digard scarf similar to the sweater pictured above, and people are always stopping me to ask me about it. If you can’t get to Sophie Digard’s shop in Paris, Ped Shoes offers many of her things online. Tres jolie. her scarves are to be adored. The spring connotations that arise when studying a Sophie Digard scarf are so vivid that only memories of bright summer days enter your thoughts. Most are comprised of tiny 'fleurs' and crochet circles stitched together, creating a classic vintage look as well as an artistic master piece. So detailed, so innovative and yet so at ease, Digard's beauties are faultless. Using fine wool, linen, or a simple sewing thread the Parisian's crocheted idiosyncratic pieces are garments to be treasured for years to come. I am in love with Sophie Digard designs, and, in fact, I own the very scarf you show but in a different color combination. I ordered it from Ped Shoes and although I had studied the work carefully using the site's "zoom" button, I was gobsmacked by how absolutely exquisite it was in person! I have never worn my Sophie Digard scarf without countless people stopping me to ask about it. « Cet objet est unique. Il est le fruit d’une rencontre : celle de la création intuitive et minutieuse de Sophie Digard et s’un savoir-faire artisanal d’une exceptionnelle précision. Depuis 1999, Sophie Digard conçoit dans son atelier parisien des modèles d’accessoires de mode et de pièces textiles dont chaque exemplaire est ensuite réalisé entièrement à la main dans des matières naturelles à l’issue d’un long processus de préparation. Le travail sur la couleur est primordial. Inspirée dans sa conception par les variations infinies des éléments de la nature, Sophie Digard propose des créations qui défient les contraintes temporelles. Nous espérons que cette histoire continuera avec vous. This objet is unique. It is the fruit of an encunter – Between Sopie Digard’s intuitive and meticulous creative work and artisanal know-how of un common precision. Since 1999, Sophie Digard has been disigning models for fashion accessories and tetile objects in her Paris workshop. Every object ist the crafted entirely by hand in natural materials after a long process of preparation. Work on colo ris of prime importance. Inspired by the infinite variation of natural elements, Sohie digard proposes creations that defy the dictates of time. We hope that this story will continue with you.